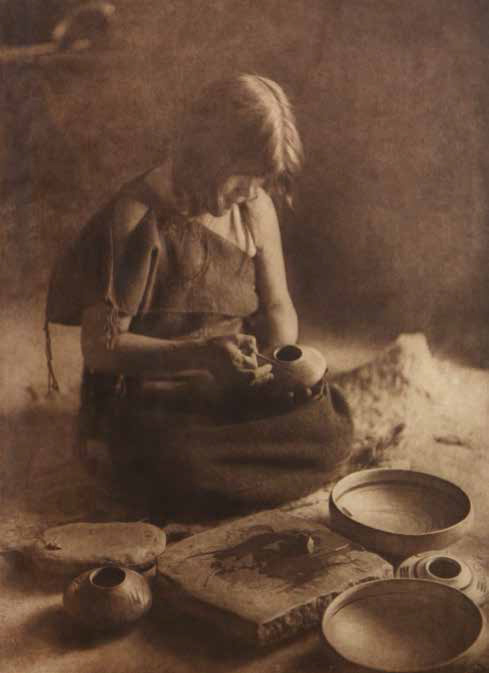 Edward S. Curtis (1868-1952), The Potter, plate 426, ca. 1906, photogravure on Japanese vellum, 17 3⁄4 x 13”. Photograph shows Nampeyo Old Lady of Hano. Visitors to Mark Sublette Medicine Man Gallery’s The Art of the Hopi exhibition in Tucson, Arizona, will get a rare opportunity to view more than 20 photogravures of Hopi people by Native American documentarian Edward S. Curtis alongside about 140 Hopi artworks including baskets, kachinas, jewelry, weavings and pottery. The exhibition includes actual pieces of artwork made by those featured in the photographs, such as Nampeyo Old Lady of Hano’s Hopi jar and Curtis’s circa 1906 photogravure on Japanese vellum "The Potter." Curtis (1868-1952) was one of the most prominent photographers and ethnologists of the late 18th century and early 19th century, photographing 80 Native American tribes during the 30 years he worked to document America’s indigenous people. 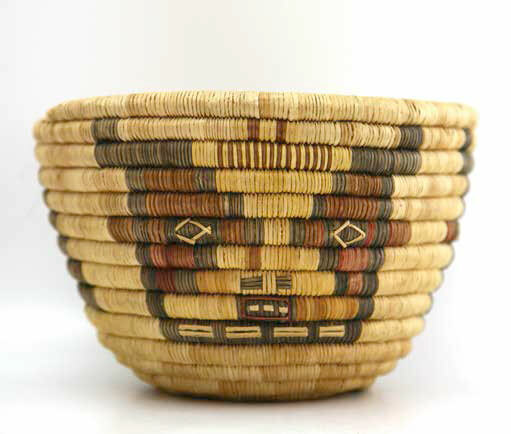 Gallery owner Mark Sublette, a longtime collector of Hopi artwork, acquired a portfolio of Curtis’ work made from the turn of the century through about the 1930s from a private collector, which the collector had purchased around 30 years ago. The photogravures depict a wide variety of scenes in Hopi life, including daily activities, architecture and maiden imagery. Curtis gained the trust of the Hopi people over several in-depth visits, where he demonstrated respect and a lack of judgment for the Hopi culture, and spent time to get to know his subjects. His legacy is documented in Timothy Egan’s 2013 book Short Nights of the Shadow Catcher: The Epic Life and Immortal Photographs of Edward Curtis. “The exhibition is a rare opportunity to see almost an entire portfolio of Curtis’ work at one time—maybe the first time you have the portfolio and artifacts and art that correspond to the same time frame these photographs were taken,” says Sublette. Another artist known for his documenting of the Hopi culture is Maynard Dixon, who will be represented in the exhibition with several drawings of the Hopi people from the 1920s, which are on loan from the Tucson Maynard Dixon Museum. The exhibition includes many examples of kachina imagery, displaying a myriad of kachinas meaningful to Hopi culture. Kachina figures are displayed in mediums such as carvings, pottery and baskets, such as the clown kachinas in the exhibition’s Hopi carving with three kachinas, and the kachina in the Hopi polychrome kachina design coil basket. Potters represented include Feather Woman, Frog Woman, and Paqua Naha, whose pieces are among early historic unsigned pots. 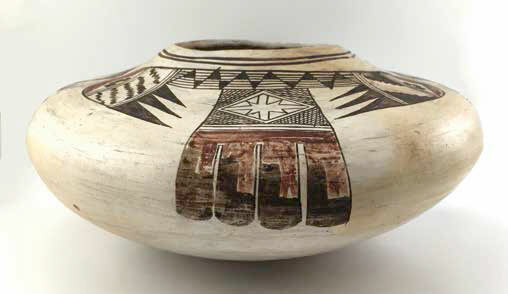 Nampeyo, considered by Native American art experts to be the most significant Hopi potter, is known for her clean and crisp designs, evident in both her hand-coiled, hand-dug pottery and carefully painted forms. Both Nampeyo’s pottery and painterly elements will be on display in the exhibition, which also includes a more contemporary work, a 1980s painting by painter and sculptor Dan Namingha. 21 x 2 1⁄2 x 2”. All images courtesy Mark Sublette Medicine Man Gallery, Tucson, AZ, and Santa Fe, NM.